Schedule a private tour of the new Aqua Tower II and all-new 2017 models. 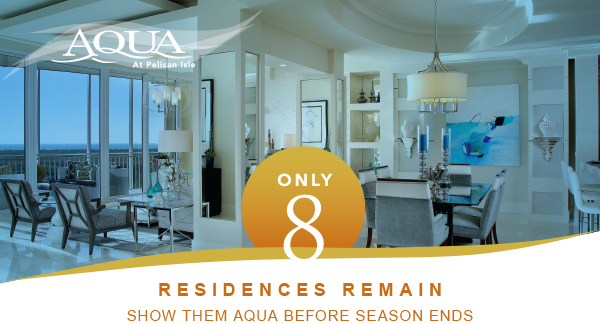 The all-new 2017 models at the AQUA Tower II offer your clientele a truly remarkable opportunity. Let them experience the open floor plans, elevated ceilings, artful interiors and the stunning water and marina views (only 6 of the 29 boat slips remain). Schedule a private tour with your clients before the season ends! Water Lifestyle: Residents who purchase boat slips have door-to-dock access (only 6 slips remain). Waterfront pavilion with comfy seating area, TV, wet bar, fire pit and more. Minutes to Naples: Dining and shopping destinations like Mercato and Waterside Shops are just a short drive away. Pet-Friendly: Newly completed dog run and convenient walking paths through Pelican Isle’s beautiful natural setting. Elite Amenities: Movie theater, private library, 24/7-attended arrival lobby, new club, AQUA social room with state-of-the-art audio/video, wet bar, fireplace, catering kitchen and more! Healthy Lifestyle: Fitness center, steam rooms and dry saunas, massage treatment rooms, Aerobics/Yoga/Pilates Room plus interactive HD golf simulator.